Here's a party favorite must have accessory! 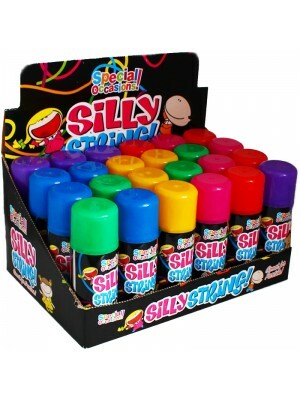 Silly string in a 200 ml can at cheap wholesale prices-6 different colors in box. Safe to spray on yourself or others. Cleans off easy once it dries. Silly String is often used during weddings, birthday parties, carnivals and other festive occasions, but it has also proven useful militarily to detect tripwires. Silly String and its imitators are reputed to be the largest selling novelty toy in the world because people buy multiple cans and use the product quickly!